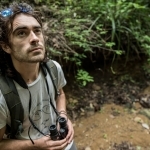 A massive congratulations to Leica Optics Ambassador, Luke Massey, who has been announced as a winner in the prestigious Wildlife Photographer of the Year awards. The 52nd award ceremony was at the Natural History Museum. A total of 50,000 entries from 95 countries were whittled down by an expert judging panel to just 100 winners, with Luke’s unique shot ‘Kite Flying’ being announced as one of 6 winners in the Urban Wildlife category. „To be part of this prestigious competition is humbling, I’ve attended the exhibition for the past 15 years, if not longer, so it is a real dream come true“, said Luke. Following a local guide, Luke climbed tiny staircases and bamboo ladders to reach this rooftop. In Old Delhi’s Muslim quarter, people toss meat to the kites to atone for their sins. ‘The sky was black with kites,’ he says, and with about 20 vying for every offering, it took hundreds of attempts to get a clear shot. Delhi’s whirls of black kites are probably the world’s highest concentration of birds of prey. They have an important role to play, clearing up carrion. But human-made kites – paper ones – pose a threat, their strings crisscross the skies at dusk and can sever the bird’s wings.